Ctenophores are fairly simple animals that live only in marine waters; they can be found in most marine habitats, from polar to tropical, inshore to offshore, and from near the surface to the very deep ocean. There are probably about 100-150 species of ctenophores throughout the world's ocean, although most of these are poorly known. I have compiled a list of all valid scientific names for the Phylum Ctenophora, meant to be useful for ctenophore biologists, but which has links to various images of ctenophores on the web that others may also find interesting. The best-known ctenophores are those that occur near-shore. Such species are typically planktonic, transparent and unpigmented, and most swim by synchronous beating of the eight rows of comb plates. Ctenophores are probably common members of the plankton in most coastal areas worldwide, although they have not been studied in many regions; ctenophores may be seasonally much more abundant in the spring and early summer. Their small size (a few mm to several cm) and transparency make ctenophores relatively inconspicuous, so even though they are not uncommon, in general they are little known. Display of ctenophores in public aquariums throughout the world has been bringing them to the attention of many thousands of viewers in recent years. The simplest tool for collecting ctenophores from a boat or off a dock is a cup-on-a-stick type jellyfish catcher: several designs are illustrated. Near-bottom plankton, deep in a fjord in Washington state or British Columbia. Center, lobate ctenophore Bolinopsis infundibulum; upper right, hydromedusa Aglantha digitale; lower left, pteropod Clione limacina; copepods. 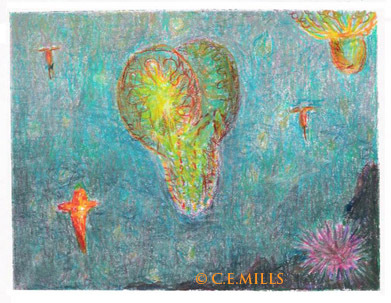 Crayon drawing by Claudia Mills, while listening to student reports about this ecosystem, December 2007. The most numerous coastal ctenophores usually have one of three quite different morphologies. Representatives of the order Cydippida are round or oblong in shape, usually less than 3 cm (about one inch) in diameter, with solid bodies distinguished by eight radial comb rows that provide locomotion, and two, usually-branched tentacles that are used roughly like fishing lines for capturing small planktonic prey. The most common cydippid ctenophores worldwide are probably species of the genus Pleurobrachia. Common coastal representatives of the order Lobata include members of the genera Bolinopsis and Mnemiopsis. These "lobate" ctenophores are usually larger than coastal cydippids, and have a pair of highly expandable lobes that are used as sticky prey capture surfaces, accompanied by short tentacles that remain inside the lobes. Like cydippids, lobate ctenophores also feed primarily on small planktonic prey. The third group of ctenophores that are commonly found in coastal areas are members of the order Beroida. Most beroids are in the genus Beroe. These ctenophores are also basically elongate animals that may be cylindrical or very flat, are often more translucent than transparent, and may be colorless or light pink or yellowish. Beroes open up like a sack to engulf their prey, which is most typically other species of ctenophores(!). In addition to the relatively well-known coastal ctenophores, there are many species found only far offshore near the surface, or in the mid-water or in the deep sea. Although the ocean seems rather uniform, each species is representative of only a small portion of the water column, defined by a combination of water temperature, light availability, depth and other factors - many oceanic ctenophore species are found under similar conditions worldwide. Oceanic ctenophores tend to be much more fragile that coastal species, because they do not need to tolerate wave action or the turbulence and sediment load of coastal waters. Some of them have fastastic, unlikely shapes. Recognizable species of open ocean near-surface ctenophores include the wing-like Venus' girdle, Cestum veneris. Lesser known species include the lobe-flapping Ocyropsis, which does a kind of frog kick with its feeding lobes for locomotion. Through observations carried out by open water scuba divers and by manned or unmanned submersibles in the last couple of decades, scientists now have a much better knowledge of these oceanic species, many of which are still unnamed (and many others probably still unknown). A few of the oceanic species turn out to get quite large, approaching a meter in maximum dimension, but they are usually so fragile that they cannot be collected in nets. Since these fragile species do not preserve well, our best records are in the form of photographs taken from submersible vehicles. Most ctenophores that live near the surface of the ocean (including coastal species) are colorless, like the extremely transparent Deiopea kaloktenota, but many of the deeper-dwelling oceanic species, such as Bathyctena, or the still-unnamed "Tortugas red," can be highly pigmented. A few ctenophores (those in the order Platyctenida) live on the bottom or in symbiosis on the surfaces of specific plants or animals. Platyctene ctenophores are nearly always found in warm water (although three species have been found on the cold, deep sea ocean floor) and are usually only a few cm in diameter. One of the best introductions to the platyctene ctenophores is this discussion on the Sea Slug Forum(! ), as many divers mistake these benthic ctenophores for sea slugs. These ctenophores are planktonic with comb plates only as larvae. After their planktonic larvae settle down, the often brightly-colored benthic adults look more like nudibranchs or flatworms than ctenophores - they are frequently colored similarly to their substrate organism, so that, for instance, a pink or orange sponge or starfish may support pink or orange platyctene ctenophores. These benthic ctenophores have branched tentacles similar to those of cydippid ctenophores and the presence of these expanded tentacles during feeding is often the feature that allows an observer to recognize these organisms as ctenophores. One of the most delightful characteristics of ctenophores is the light-scattering produced by beating of the eight rows of locomotory cilia, which appears as a changing rainbow of colors running down the comb rows. Many people assume that they are seeing bioluminescence when they see this rainbow-effect, but really this is simple light diffraction or scattering of light by the moving cilia. Most (but not all) ctenophores are also bioluminescent, but that light (usually blue or green) can only be seen in darkness. I was unable to locate any images of ctenophore bioluminescence to point to on the web; most of the images that claim to show luminescence do not. Check out the Bioluminescence Web Page for a general discussion of bioluminescence; in the Myths section on the Bioluminescence Web Page, Dr. Steven Haddock explains the different kinds of light shows produced by ctenophores (see the third Myth). How do ctenophores fit into the food web? All ctenophores are carnivores. Most feed using a pair of highly extensible, usually branched, sticky tentacles that adhere to small zooplankton prey. The mouth of a ctenophore is at one end; in this image, the mouths are all at the top, protruding just a bit, with a transparent gut stretching down about halfway through the body below it. The prey of cydippid and lobate ctenophores in general includes small crustaceans such as copepods, amphipods, and even euphausiids (krill), and larvae of other marine invertebrates such as clams and snails. As mentioned above, the principal prey of beroid ctenophores is other ctenophores. In turn, ctenophores are eaten by many species of medusae (jellyfish) as well as by sea turtles and some fish. The tentacles of most cydippid and lobate ctenophores are covered by specialized microscopic sticky structures known as colloblasts, that adhere to the prey. After prey capture, the tentacle with its adhering captured-prey is contracted and brought across the ctenophore's mouth (often by a rolling/spinning motion by cydippid species), where it is released as the prey is ingested. A few cydippids use other prey capture methods: Euplokamis has tentacles with an unusual musculature (in addition to the sticky colloblasts) that allows them to coil around prey items to help control captured prey on its way to the mouth; species of Haeckelia carry nematocysts ("stinging cells") on their tentacles instead of colloblasts - these nematocysts are sequestered from the medusae that Haeckelia feeds on and are then recycled for use in feeding by these ctenophores. In general, ctenophores are recognized to be planktonic carnivores, but have been treated as unusual and perhaps unimportant members of marine ecosystems by most marine scientists and oceanographers. It was pretty much to everyone's amazement that the accidental introduction via a ship's ballast water of an American ctenophore, Mnemiopsis leidyi, into the Black Sea in the early 1980s, caused a full ecosystem fisheries collapse within less than 10 years, leaving the fishermen in all 6 countries surrounding the Black Sea out of work. Mnemiopsis leidyi managed to outcompete the native planktonic fishes for food, mostly by eating nearly all of the zooplankton in the water before the fish eggs hatched, so there was little left for the native fish larvae. The adult fish remaining in the Black Sea system were also in poor condition as a result of having to compete with the more-successfully-fishing Mnemiopsis ctenophores for food. Millions of tons of fish in the Black Sea were basically replaced by millions of tons of (inedible) ctenophores. Mnemiopsis populations in the Black Sea have finally come under control in the last few years with the "spontaneous" appearance of a predatory ctenophore Beroe ovata, which appears by its morphology to also be an import from American waters, but the ecosystem is still dominated by exotic ctenophores (and the jellyfish Aurelia). Read more about this story here and here. A similar scenario is now playing out a decade later in the nearby Caspian Sea, after Mnemiopsis travelled between the two bodies of water, possibly via the canal system connecting them. The Mnemiopsis-eating Beroe also arrived within short order, meaning that things may play out somewhat differently in the Caspian Sea, but there is no doubt that the arrival of these (2) invasive ctenophores will bring great changes to the Caspian Sea (affecting 4 additional countries) as they did in the Black Sea. Mnemiopsis leidyi had moved from the Black Sea to the Turkish coast of the eastern Mediterranean by the mid-1990s, and by the late-2000s, made it to the North Sea and the Baltic Sea, where its populations are growing and it seems to be well-adapted. There has been every reason to expect it along either the Mediterranean or Atlantic coasts of Italy, France, Spain and Portugal in the near future and indeed reports of this species in France, Italy, Spain, and Israel, appeared in 2009. It is not difficult to imagine this originally-American species finding its way even as far as Australia in the future. I am deeply concerned about the recent interest by the public aquarium industry in displaying Mnemiopsis. Many aquariums would like to exhibit a ctenophore, since public interest in jellyfish is high, and Mnemiopsis is a tough, resilient animal that is simple to maintain and interesting to watch. Its invasion history is also remarkable and a story that would play well at public aquariums. However, few of the people involved in maintaining these displays are aware of the truly disastrous possible consequences of the escape of Mnemiopsis into an ecosytem in which it is not native. One of the reasons that it multiplied so rapidly and effectively in the Black Sea, was that it had no natural predators; its natural dynamic is also to be present in enormous numbers in late summer in the bays where it normally occurs. Even with all possible precautions in place to assure no escape of the ctenophores from aquarium to the sea, I firmly believe that the risks are too high to justify (sale,) transport, and culture of Mnemiopsis for display outside of its native range or where it has already well-established itself. Unlike many of the jellyfish (which have a complex life cycle with both a benthic polyp and a planktonic medusa stage), ctenophores have a simple life cycle. With the exception of the Platyctenida (see Benthic ctenophores above), ctenophores carry out their entire life cycle in the plankton, so they are considered to be "holoplanktonic". Most, but not all, species of ctenophores are hermaphroditic, meaning that a single ctenophore carries both male and female gonads. This means that a single animal can produce both eggs and sperm. Ctenophores spawn these eggs and sperm freely into the sea, where the sperm must first find the eggs, and the eggs are then fertilized. Fertilized eggs develop through a larval stage that hatches out of the free-floating fertilized egg and gradually grows into an adult ctenophore (the planktonic larvae of benthic ctenophores settle to the bottom before taking on their final adult form). It is thought that most of the hermaphroditic ctenophore species are self-fertile, which means that it only takes one ctenophore to make more ctenophores - this seems to be true in the few species in which the idea has been carefully tested in the laboratory. Also in the few cases where it has been examined, it appears that ctenophores reproduce at a young age (small size). Whereas most medusae grow to adult size before beginning to produce eggs or sperm, ctenophores seem to produce small numbers of gametes before they reach adult size, and thus may have very rapid generation times, resulting in rapid population growth. After attaining their adult size, ctenophores will spawn eggs and sperm daily (for weeks), as long as there is sufficient food available in the plankton. Starved ctenophores stop producing gametes and then the ctenophore begins to shrink in body size in the absence of food. When food becomes available, the animal grows again to some predetermined size and then begins to put energy into gamete production again. Ctenophores and medusae - are they related? Ctenophores and medusae are both planktonic, carnivorous, often transparent and tentacle bearing, animals, whose bodies are largely composed of water. They are often found together in the sea and some authors including me sometimes loosely refer to both as "jellies" or even "jellyfish". But Ctenophores are in their own phylum, the Ctenophora, and medusae are in the phylum Cnidaria. Both groups were at one time placed together in the phylum Coelenterata, but this concept has been replaced by two phyla with increasing separateness. Several decades ago, one of the arguments for association of Cnidaria and Ctenophora was the presence of nematocysts in both groups, but nematocysts in Ctenophora were then shown to come from their cnidarian prey. Recent molecular evidence has shown even more apparent separation in the evolution of the Cnidaria and the Ctenophora. Generally speaking, "jellyfish" is a term that refers to medusae, those bell-shaped jellies that are common in coastal waters and swim like an umbrella that opens and closes. So no, in general it is not really fair to say that ctenophores are jellyfish. Sometimes though, for convenience, scientists lump medusae and ctenophores together and call them both "jellyfish", when the scientists are trying to make a point about these two groups of unrelated organisms that are ecologically very similar and often found in the same places (see also the paragraph just above this one). 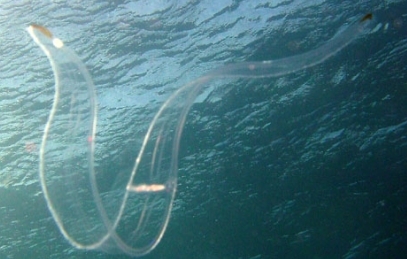 Recently some scientists are including the very dissimilar salps under the word-umbrella "jellyfish", but the salps, which are chordate-herbivores in the subphylum Tunicata, and have their own closer-relatives including doliolids, pyrosomes, and appendicularians (larvaceans), are really not jellyfish in any traditional sense of the word. Including them as jellyfish is probably just too confusing and inaccurate. Wrobel, D. and C. Mills, 1998 - reprinted with corrections in 2003. Pacific Coast Pelagic Invertebrates - A Guide to the Common Gelatinous Animals. Sea Challengers and the Monterey Bay Aquarium, Monterey, California, iv plus 108 pages (Book). This book includes an introduction to the Ctenophora and descriptions with color or black-and-white photographs of 28 species of west coast ctenophores, most of which are also found elsewhere in the world. The corrections added in 2003 were mostly in the Phylum Mollusca. Mills, C.E. 1996. Additions and corrections to the keys to Hydromedusae, Hydroid polyps, Siphonophora, Stauromedusan Scyphozoa, Actiniaria, and Ctenophora, pp 487-491 (authorship of these corrections is not given within the text). In Marine Invertebrates of the Pacific Northwest, with revisions and corrections (E.N. Kozloff). University of Washington Press, Seattle. These revisions include a new key to the five local species of Beroe. Mills, C.E. 1987. Key to the Ctenophora (pp. 79-81). In Marine Invertebrates of the Pacific Northwest (E.N. Kozloff, ed.) University of Washington Press, Seattle and London. This is a key to 11 species of ctenophores found in the Washington state/British Columbia region. It was revised and updated in the 1996 edition, above.